From Chicken Run to Nick Park’s Wallace & Gromit films, Aardman Animation has consistently offered excellent animated efforts that position the studio as the English equivalent to Pixar or Studio Ghibli. Anyone familiar with Aardman’s work acknowledges the impressive attention to detail in their stop-motion animated features. The scale of sets and character movement displays individuals who obviously have a masterful handle on their craft. Still, it’s not as if the stellar technical aspects of the film serve to compensate any other aspect of their films. The impressive craftsmanship is married with strong storytelling, sharp wit, and a strong ensemble cast of characters. It’s what one can expect with The Pirates! Band of Misfits, though it’s an effort unfortunately handicapped by a more frantic energy. The film navigates through a simple narrative. The Pirate Captain (Hugh Grant) is a mid-tier pirate who runs a fairly incompetent crew. Accompanied by a big-boned parrot (who happens to be a dodo), the crew believes their recent string of successful plunders could lead to the Pirate Captain’s winning the Pirate of the Year award. The competition is stiff though, as he soon realizes that his successes are dwarfed by that of his rivals. This soon prompts the Pirate Captain to go on a full-scale assault of the high seas, with little success. It’s only until he gets on-board a ship housing Charles Darwin does the Pirate Captain make any headway, much to the chagrin of his crew. 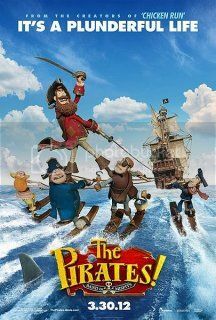 Whereas Chicken Run or the Wallace & Gromit films attempt to bridge a gap where they can be enjoyed by both adult and child, The Pirates! Band of Misfits is tailored specifically toward children. Whereas none of Aardman’s efforts ever really took themselves too seriously, this film’s hyperkinetic energy is a bit off-putting, particularly as its gags begin to register as juvenile. Problematic as it may be, the film does value those who pay attention to details. The technical nuance in set designs and witty banter is manages to keep the film afloat as it sets sails on a fairly light narrative voyage. The balance is just heavily skewed to children, which has rarely been the case for previous Aardman features. Despite the unevenness of its narrative structure, the intangible factors of its design elevates the material just enough to make it worth a look. Perhaps it comes across as forced praise, but this stems largely from heightened expectations not being met – there’s still a treasure trove of quality here.